Unifyed Integrates with a variety of Student Information Systems and Enterprise Resource Planning Systems. UnifyedTM platform integrates with a range of Student Information Systems to enable secure, relevant and timely extraction and updating of student activity and engagement information. The utility of campus apps that students use would depend on ability to extract and work with student profiles, course registrations, class schedules, grades among other aspects. Students would need instant and continuous access to SIS systems for viewing and marking their attendance for registered classes, accessing their registration and financial aid information from the convenience of their laptop/desktop/tablet or mobile device, irrespective of whether they are on campus or off campus. Unifyed Platform through its range of technology and application adapters enables a seamless access and updating of relevant student information to provide the convenience and efficiency, campus apps are expected to provide. 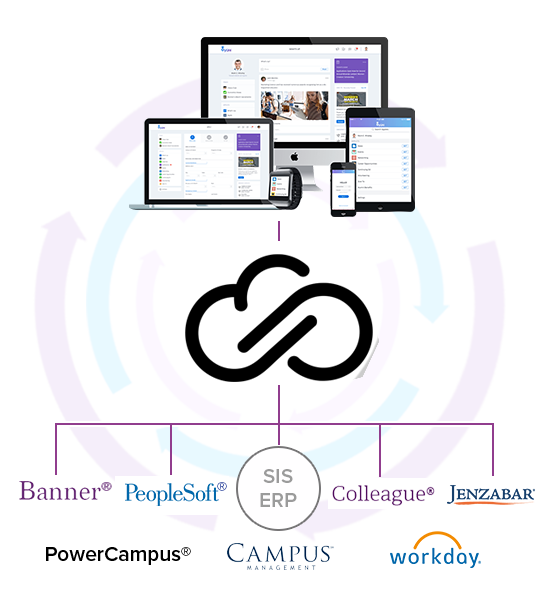 Unifyed integrates with Ellucian® Banner®, Colleague®, Jenzabar® PeopleSoft®, PowerCampus®, workday® and Campus Management®.